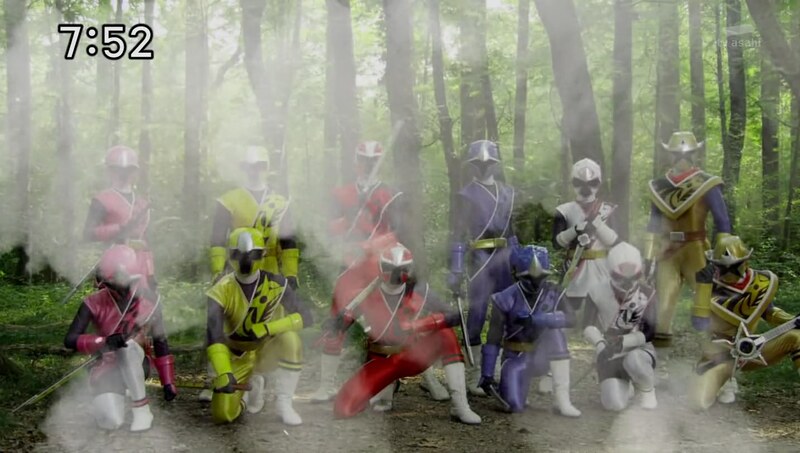 Recap: Shuriken Sentai Ninninger, Episode 29 – Ninja Board Game – Definitive Edition! Grandpa tells the kids that Kyuuemon stole all of Father’s Nintality and all his memories of training. 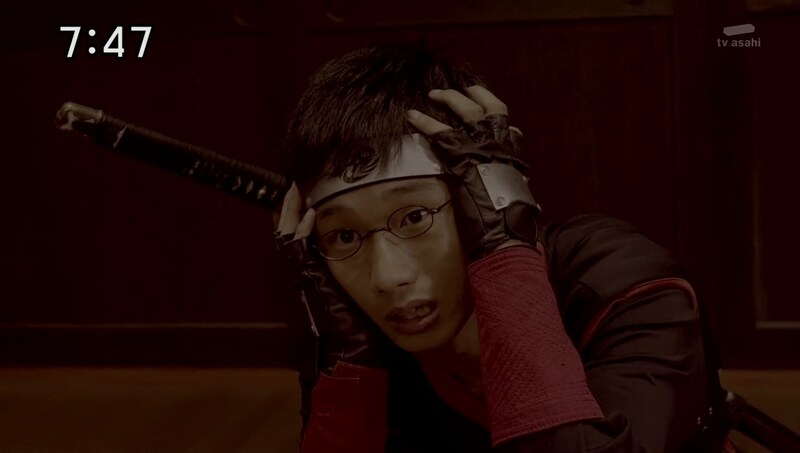 That is why Tsumuji can’t use Ninjutsu and can’t remember why. Grandpa asks them not to tell Father about any of this. Of course, Fuuka says. They could never. Meanwhile, Kyuuemon summons Ninja Ikkakusai and orders him to collect some fear from children. Ikkakusai heads downtown and lures kids into a lifesize Ninja Board Game. Back at the dojomanse, Father asks Fuuka if she’d like to go grocery shopping with him, but she’s studying. Yakumo is also reading up on magic and Father commends him on working to achieve his dream of becoming a ninja wizard. Yakumo says his Mommy had given him a wand and he has pursued the interest since. Father says he understands. 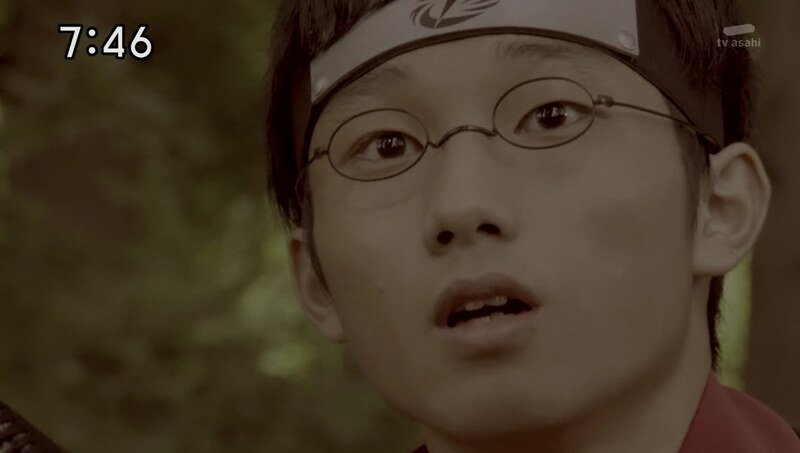 He remembers Grandpa complimenting him the first time he threw a shuriken. That’s when Father decided to become a ninja. Fuuka is surprised he remembers that. Of course, Father says. He also remembers getting in trouble with Grandpa for using Ninpou in PE. Fuuka asks if he remembers how he lost his ability to use Ninjustsu. But Father says he just forgot for some reason. “I fell down and hit my head in the bathroom, perhaps?” Father jokes. Yakumo asks what he would do if he found out the reason. But Father says maybe it’s better if he doesn’t know. The others suddenly call Yakumo and Fuuka to come downtown as they fight off a group of Supparage. More kids are being lured into the board game. Ikkakusai introduces himself to the six Ninningers and explains the board game. If they want to save the kids, they must also go in and play. They head inside and decide to split up as players just in case they get trapped. 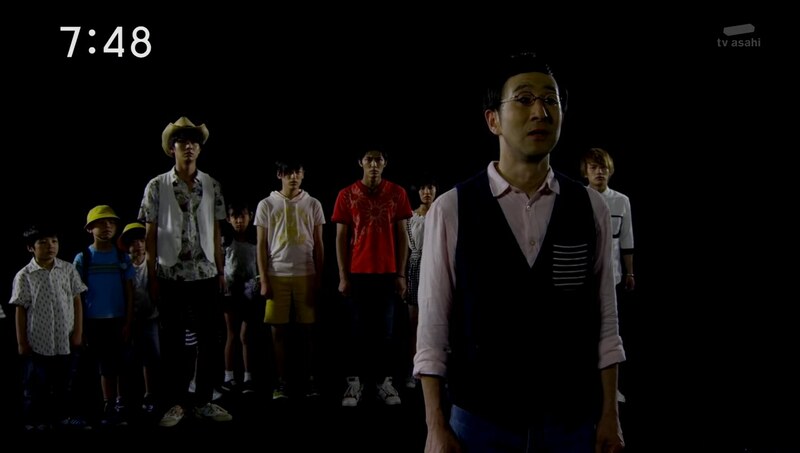 Takaharu, Nagi and Kinji roll the dice first. Takaharu easily takes care of the first challenge: Receive a compliment for hitting the bull’s-eye with your first shuriken. A Supparage with a Grandpa mask pops out to fulfill the task. They move forward six spots and end up at a school where they see a group of Supparage bullying another Supparage with glasses. Takaharu headbutts the lead guy and the three Ninningers fight them off. They complete the next challenge, receive gratitude from a friend you’ve saved from bullies. They move forward again and end up in a dark room where they find the kids curled up and crying. This challenge: Lose your power, dream in ruins, fall into despair. Meanwhile, Yakumo, Kasumi and Fuuka roll the dice and they end up at a gym where they use Ninpou to jump over a HUGE pommel horse. Their Supparage “classmates” cheer them on. But another Grandpa-masked Supparage scolds them. They’ve completed the challenge, but must return six spots. Yakumo and Fuuka realize this board game is based on Father’s life using his stolen memories! Yakumo thinks they can get through it if the bring Tsumuji here. Fuuka thinks it would be cruel to put her father through recovering his memories. But Yakumo doesn’t agree. He doesn’t believe his Uncle is that weak. To get out of the board game, they return the six spots they were told to earlier. 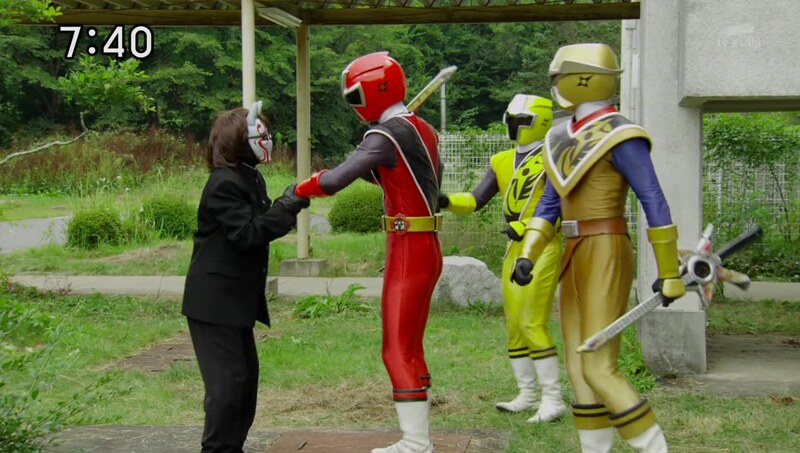 They are immediately met by Ikkakusai, but Kasumi and Fuuka henge to hold him off and allow Yakumo to head home. Yakumo explains the situation to Father and he is more than willing to come help. They hurry back and quickly run into the game. They are immediately placed into the dojomanse. Supparage Grandpa introduces them to a new pupil, Kyuuemon. 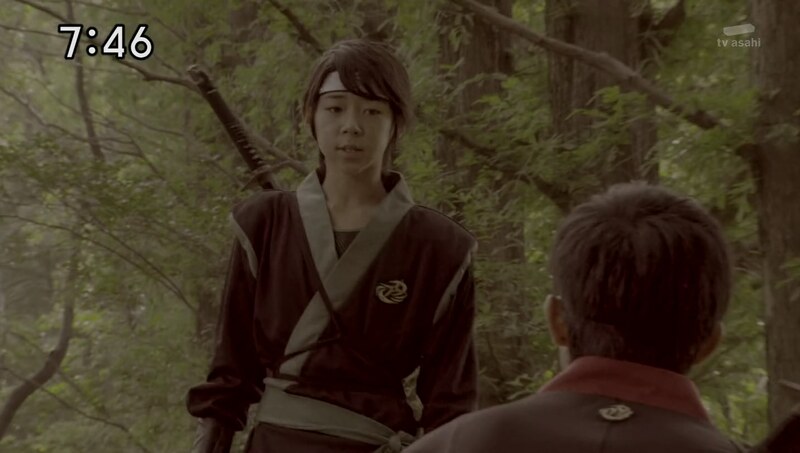 Kyuuemon greets “young master” Tsumuji and Grandpa tells both of them to train hard. 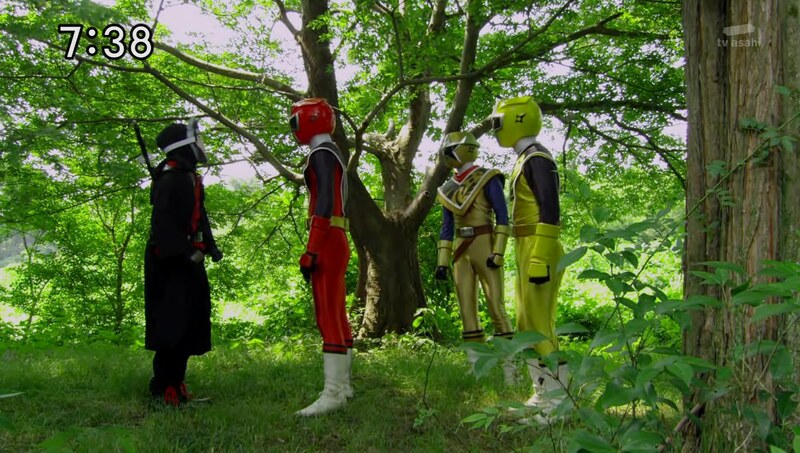 They move forward and the next memory is of Kyuuemon saving Tsumuji from an enemy who caught him off guard. Tsumuji understands. But later at the dojomanse, Grandpa comes across Kyuuemon stealing Tsumuji’s Nintality. 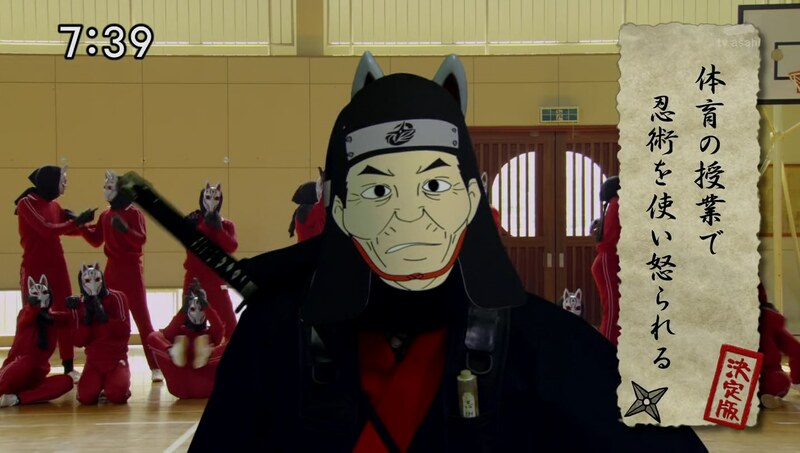 Kyuuemon says it was Grandpa himself who said Tsumuji was unfit to be a ninja, so he took his powers. That is what happened to Tsumuji: Lose your power, dream in ruins, fall into despair. Lose turn… forever. This darkness that they’ve ended up in with the kids is the darkness one feels when their dream is taken away from them. 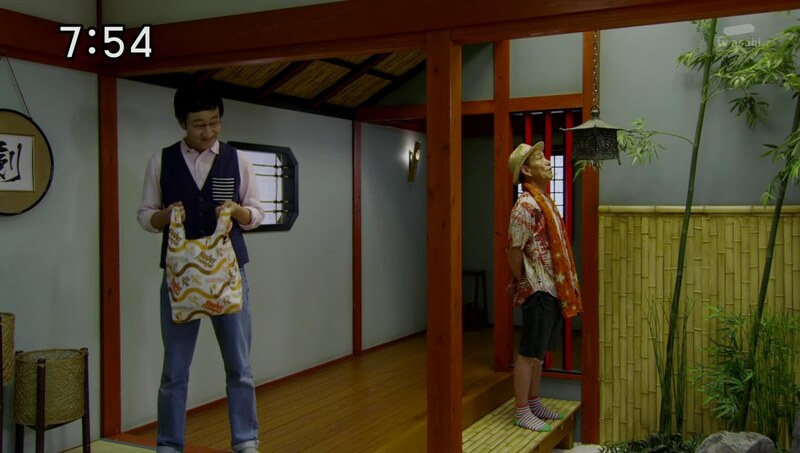 Fuuka is upset with Yakumo and says she knew this was a bad idea. But Father says no. He did say that he didn’t need to know the truth. But now that he does, he understands. When a talented young ninja appeared and his father told him he wasn’t fit to become a ninja, he had just given up. None of that should’ve mattered, however, and he should have never given up. He should have fought back. Father says he doesn’t want his children, niece and nephews to make the same mistake. Father says dreams always start in the dark. Which is why you must light your own path to it. Father turns to Yakumo. He asks if he knows how to become a magic ninja. Yakumo says no, but he doesn’t plan on giving up. Exactly, Father says. So what will Yakumo do? Yakumo uses his magic wand and literally lights a path to an exit. The others use Gold Technique to amplify the path with some rainbow power and they all run out of the game. Father says he’ll take care of the kids. The Ninningers henge. Ikkakusai uses his die to multiply the effect of his attacks. But the Ninningers use Cloning Technique to multiply their own attacks. Takaharu goes Chozetsu to finish Ikkakusai’s first life. Kyuuemon embiggens him and the Ninningers quickly hop into Ha-Oh ShurikenJin. 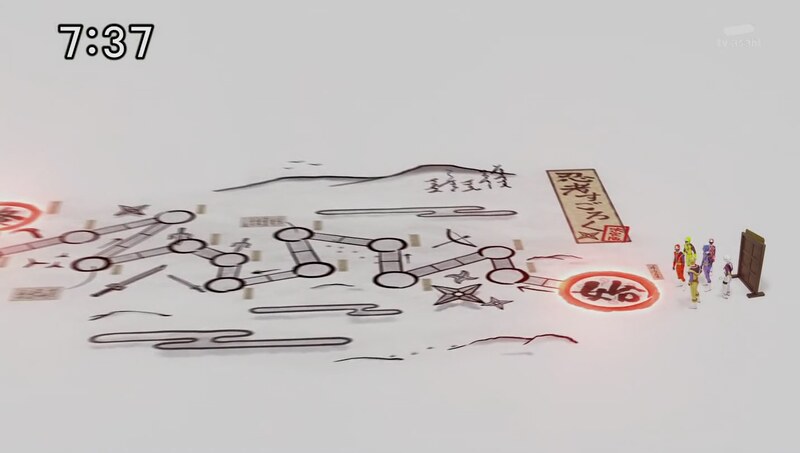 Ikkakusai begins relating the history of board games. 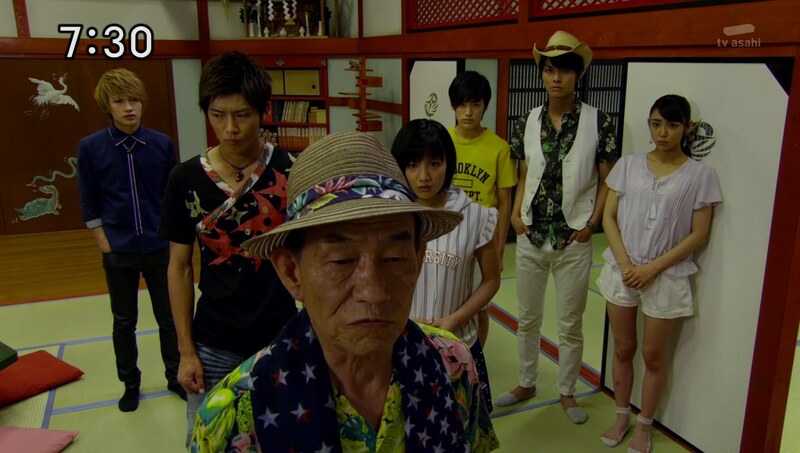 Yakumo tells Takaharu to get to it and the Ninningers quickly take care of Ikkakusai. Back home, Grandpa meets Father as he arrives home with the chicken for tonight’s dinner. Grandpa takes this opportunity to apologize to his son. Father says it’s alright. 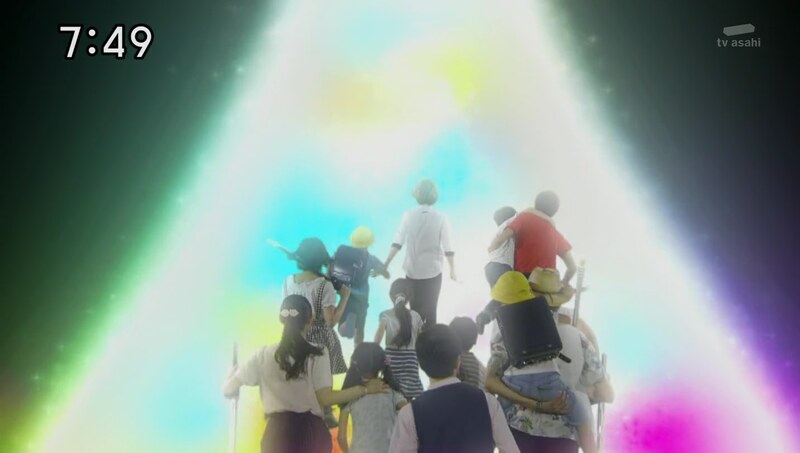 Even while his dream didn’t come true, Takaharu and Fuuka are carrying it on. And that’s all thanks to Grandpa. Grandpa hugs Father and says he’s looking forward to the fried chicken dinner. The Ninningers come in and are happy all is finally well between Grandpa and Father. Fuuka thanks Yakumo. 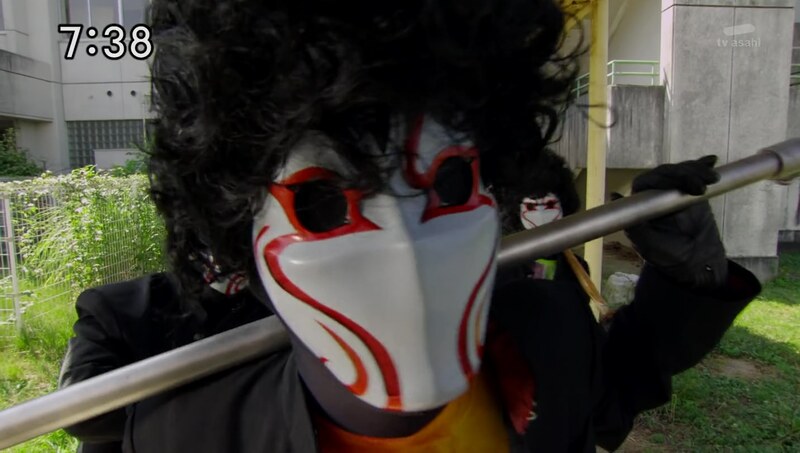 Yakumo asks Takaharu what he’ll be doing now. 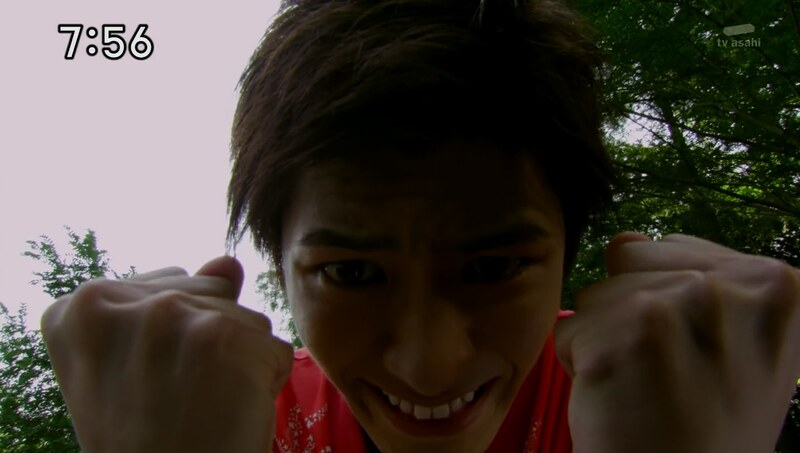 Takaharu says he’ll settle things with Kyuuemon and take back Father’s powers. Fuuka stops Takaharu from yelling, so Takaharu runs out and screams his hotness in the park instead. But a pretty young lady, who appears to know him, watches from behind a tree. Yess!!! This was a great episode. Maybe one of the best of the season. I’ve always expressed how the family stories are my favorite part of this season. So I loved seeing more of the family backstory, especially some nice clarity on the tension between Father and Grandpa. Finally! Some answers! Seeing little Kyuuemon was great too. I hope we see more flashbacks like that to fill out his character. Finally, things will get interesting. I think there is a lot of potential in that part of the story. Another great story would be to see a whole arc with Tsumuji vs Kyuuemon. That would be another interesting story to watch. 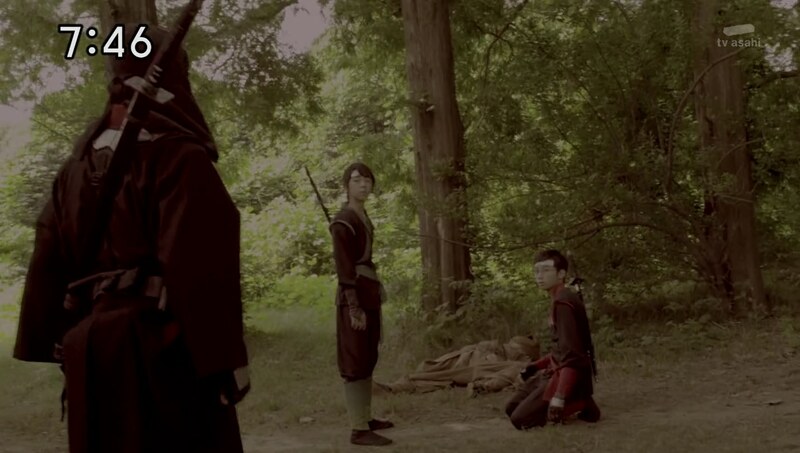 Teens growing up training as ninjas, in a more serious way, not like the Ninningers. 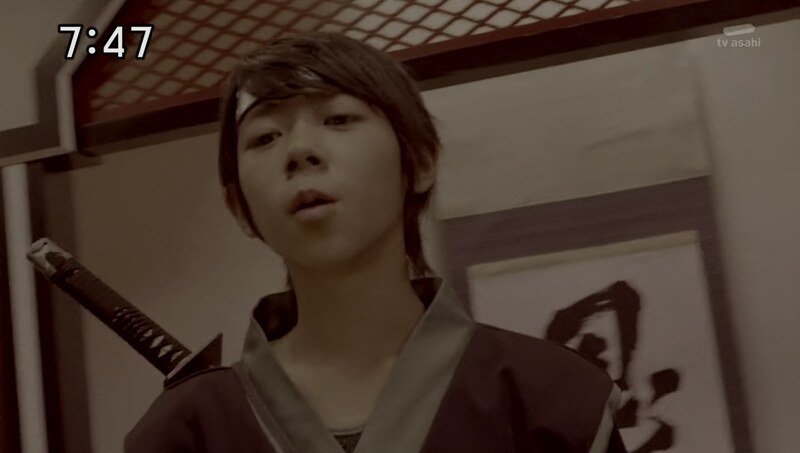 It actually almost reminds me of Warrior Baek Dong Soo. Maybe a movie plot! It might also be interesting if Father and Kyuuemon ever face off again in the future. I was a little unsure at the start of the episode what this would be about, but it really picked up and the flashbacks and revelations were handled very well. It was nice involving Yakumo and his ninja wizardness as well as Fuuka caring for her father. One of my favorite episodes of the season. ← Recap: The Amazing Race Canada 3, Episode 11 – "We play clean and fair."